In my last post, I mentioned about how and why I happened to love Mayo. I made a use of Del Monte Tartare dip mayo to make Tuna Mushroom Open Sandwich which absolutely mouth-watering. Now this post has something different for you all. 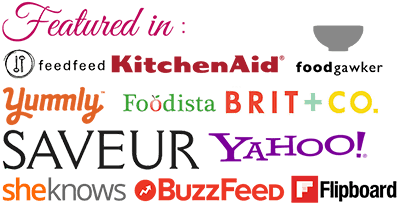 We all are aware of sandwich spread available in the market which we use only as a spread for sandwiches. Have we ever thought to beyond this and try using sandwich spread little differently? Ok, let’s see how we can use it in other ways to make stunning fare.Do you love pancakes and binge on it almost every breakfast? I am sure, when the word pancakes come to mind, mostly it’s all about the sweet versions. But, the savory pancakes are also equally as tasty as the sweet ones. 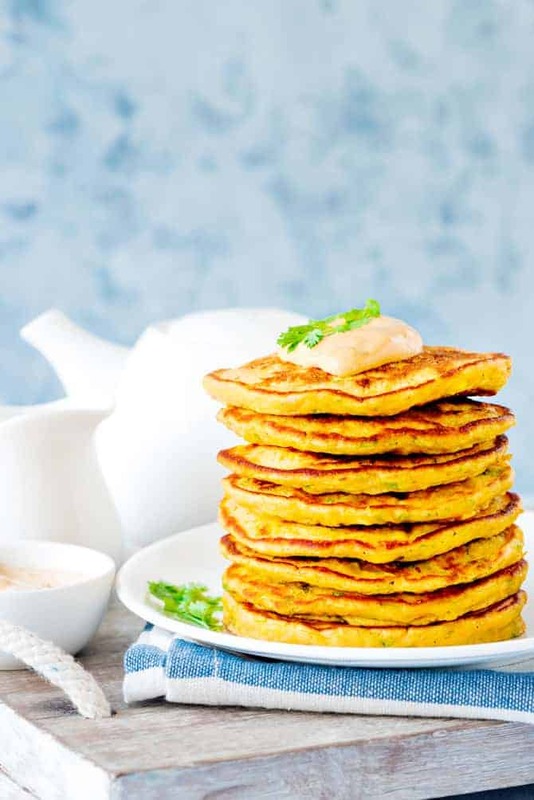 So, here is delicious soft fluffy Carrot Corn Pancakes is a must try, which I did using Del Monte Sandwich Spread Mayo. 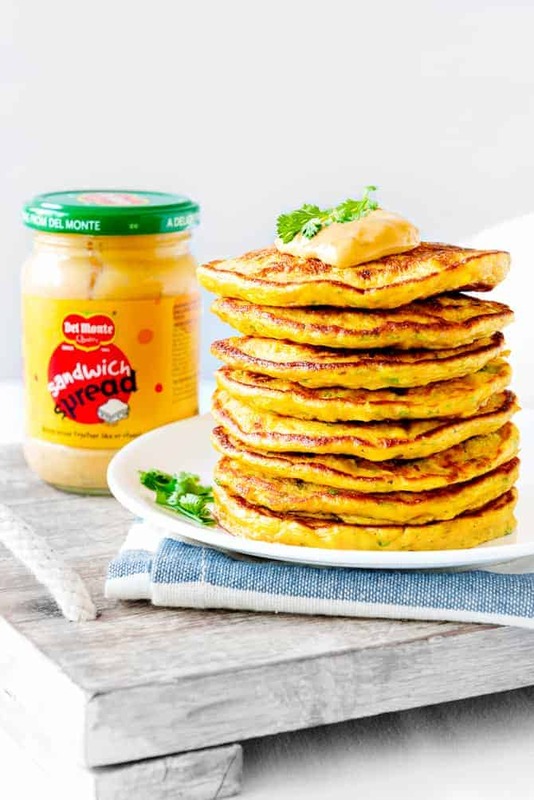 A savory pancakes loaded with goodness of carrot, corn eggs and whole wheat flour but the flavor master here is Del Monte Sandwich Spread Mayo. It adds an extra tang, aroma and richness to the dish making it impossible for you to resist. Yeah, Del Monte Sandwich Spread does not enhance the taste for sandwiches only. 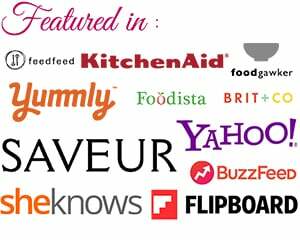 It heightens the tang as well as richness of any dish you make using it. These hot Carrot Corn pancakes with sandwich spread were so scrummy that it was washed off in no time. 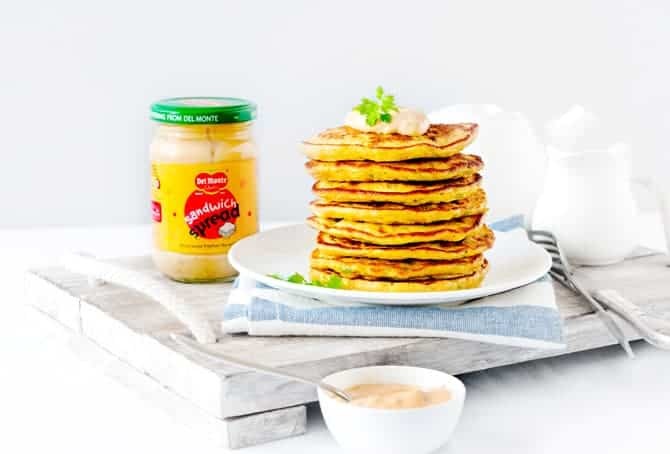 Pancakes have always been kid’s favorite, and addition of this sandwich spread makes it more interesting, and tasty for them to indulge it not only for their breakfast but for their School lunch boxes too. The wholesome goodness of veggies, whole wheat and eggs and Del Monte Sandwich Spread is perfect combination on a plate. In a large bowl, add eggs, yoghurt and sandwich spread. Combine very well. Add carrot, onions, chilies, corn and season with Salt and pepper. Mix very well. In another bowl, add flour, baking soda and baking powder, mix well. Now add the dry flour mixture to the carrot mayo mixture. Mix to form a thick pan cake batter. The batter should be of thick creamy consistency. Heat flat griddle or pan. Grease it with little butter. Pour a ladle full of pan cake batter and cook for couple of minutes. Gently flip to cook on the other side for another 2 to 3 minutes. Take the pancake off the heat. Serve hot with Del monte mint mayonnaise along the side.